Although Lehman Brothers filed for bankruptcy on Monday, September 15, 2008, it was actually “bombed” on September 11, when the biggest one-day drop in its stock and highest trading volume occurred before bankruptcy. Lehman CEO Richard Fuld maintained that the 158 year old bank was brought down by unsubstantiated rumors and illegal naked short selling. Although short selling (selling shares you don’t own) is legal, the short seller is required to have shares lined up to borrow and replace to cover the sale. Failure to buy the shares back in the next three trading days is called a “fail to deliver.” Christopher Cox, who was chairman of the Securities and Exchange Commission in 2008, said in a July 2009 article that naked short selling “can allow manipulators to force prices down far lower than would be possible in legitimate short-selling conditions.” By September 11, 2008, according to the SEC, as many as 32.8 million Lehman shares had been sold and not delivered – a 57-fold increase over the peak of the prior year. For a very large company like Lehman, with plenty of “float” (available shares for trading), this unprecedented number was highly suspicious and warranted serious investigation. But the SEC, which was criticized for failing to follow up even on tips that Bernie Madoff’s business was a ponzi scheme, has yet to announce the results of any investigation. Other questions about the Lehman collapse are raised in David Wessel’s July 2009 book In Fed We Trust. 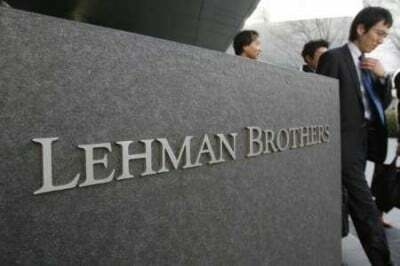 Why was Bear Stearns saved from bankruptcy but Lehman Brothers was not? How could the decision makers not realize the dire consequences of letting Lehman go down? One possible explanation is that they actually thought the bank would be bought out at the last minute, just as Bear Stearns was. In both cases, the parties worked feverishly over the weekend after the stock’s collapse to try to negotiate a deal. For Bear Stearns, the negotiations succeeded, with the help of the New York Federal Reserve, which provided the loan used by JPMorgan Chase to complete the deal. With Lehman, however, the interested buyer was British, and the help that was needed was from the UK Chancellor of the Exchequer, Alistair Darling. The weekend after the September 11 stock collapse, intense negotiations were pursued with Barclays Bank, which was prepared to underwrite Lehman’s debts; but it needed a waiver from British regulators of a rule requiring shareholder approval. Negotiations continued until the market was getting ready to open in Japan on Sunday, but UK Chancellor of the Exchequer Alistair Darling would not give the necessary waiver. He said something to the effect that he did not want to infect Britain with America’s cancer. The sentiment was understandable, but the question was, why did he wait until it was too late for the Treasury or the Federal Reserve to move in with other arrangements? The issue takes on more significance in light of the fact that Chancellor Darling played a similar role in another 9-11 collapse the previous year. On September 11, 2007, frantic customers were lining up outside Northern Rock, the UK’s fifth largest mortgage lender, in the first British bank run in 141 years. The bank’s shares plunged 31% in a single day. Like the collapse of Lehman Brothers in the U.S., the bankruptcy of Northern Rock changed the rules of the game. Britain’s major banks too would now be saved at any cost, in order to avoid the loss of customer confidence, panic and bank runs that could precipitate a 1929-style market crash. With Northern Rock, as with Lehman Brothers, Alistair Darling could have saved the day but backed down. Northern Rock had a willing buyer, Lloyds TSB; but the buyer needed a loan from the Bank of England, which the Bank’s Governor, Mervyn King, had denied. Darling was advised by his staff to overrule the Governor and grant the loan, but this would have cost political capital for UK Prime Minister Gordon Brown, who had been widely lauded for giving the Bank of England its independence in 1997. Brown is criticized domestically for precipitating the financial crisis with errors made as Chancellor of the Exchequer before he became Prime Minister. Critics maintain the British Treasury has abdicated its responsibility as the financial overseer of the British economy to the Bank of England, which in many ways controls the government, because its advice is always followed regarding the British budget. The whole scenario suggests that the much-vaunted virtues of an independent central bank are overblown. Some economists, including Milton Friedman and Ben Bernanke, blame poor policymaking by an independent Federal Reserve for bringing on the Great Depression of the 1930s. According to Representative Paul Kanjorski, speaking on C-SPAN in January 2009, the collapse of Lehman Brothers precipitated a $550 billion run on the money market funds on Thursday, September 18. This was the dire news that Treasury Secretary Henry Paulson presented to Congress behind closed doors, prompting Congressional approval of Paulson’s $700 billion bank bailout despite deep misgivings. It was the sort of “shock therapy” discussed by Naomi Klein in her book The Shock Doctrine, in which a major crisis prompts hasty emergency action involving the relinquishment of rights or funds that would otherwise be difficult to pry loose from the citizenry. Like the “bombing” of Lehman stock on September 11, the $550 billion money market run was suspicious. The stock market had plunged when Lehman filed for bankruptcy on September 15, but it actually went up on September 16. Why did the money market wait until September 18 to collapse? A report by the Joint Economic Committee pointed to the fact that the $62 billion Reserve Primary Fund had “broken the buck” (fallen below a stable $1 per share) due to its Lehman investments; but that had occurred on September 15, and the fund had suspended redemptions for the following week. What dire reversal happened on September 17? According to the SEC, it was another record day for illegal naked short selling. Failed trades climbed to 49.7 million – 23% of Lehman trades. The Larger Question Is Why? In April 2009, Gordon Brown and Alistair Darling hosted the G20 summit in London, which focused on the financial crisis. A global currency issue was approved, and an international Financial Stability Board was agreed to as global regulator, to be based in the controversial Bank for International Settlements in Basel, Switzerland. The international bankers who caused the financial crisis are indeed capitalizing on it, consolidating their power in “a new global financial order” that gives them top-down global control. Just some food for thought as September 11 rolls around again.